Good morning, stocks bounced back yesterday for no other reason than Janet Yellen telling the US Congress that rates are likely to remain lower for longer. Not even the rate rise from the Bank of Canada could dampen the renewed enthusiasm for risk and even the expectation by the foreign exchange market that Australia may follow suit with a rate rise did not flow outside their little pond. Madame Yellen must be feeling somewhat confounded by falling real wages in her economy and increasing private indebtedness. We have the same problem here but more pronounced and that situation is likely to stay the Reserve Bank’s hand on interest rates making the AUDUSD cross at 0.7725 a raging sell. The listed property trusts have been on the slippery slide of late, not for any bad reason but they do react to movements in the long term bond rate which has risen on the back of various central banks airing their views on monetary policy. 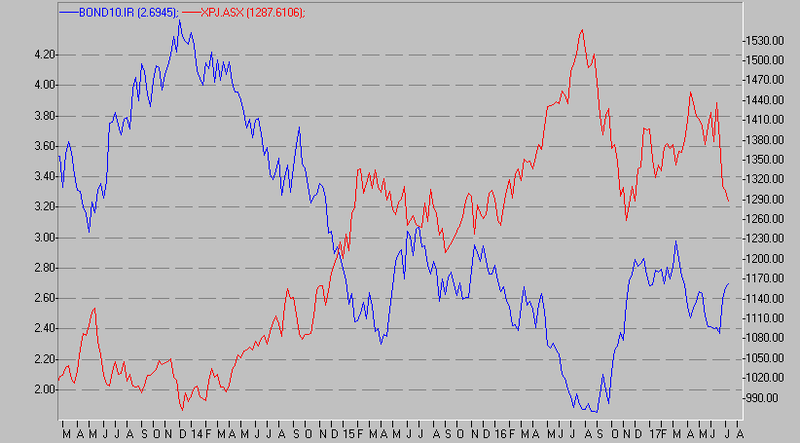 Take a look at the chart below which shows the inverse relationship between listed property trusts (red) and the 10 year bond (blue). One may like to consider listed property trusts as pseudo bonds, you know bricks and mortar that pays income. If we accept that these “pseudo bonds” should trade on a yield spread to the “risk free” government bonds that is why the property trust prices wax and wane with movements in the bond rate. A pretty steady night slowly drawing to a close with the major bourses all in the black, commodity prices generally in the red and major bond yields a tad higher. Index futures are suggesting a 9 point dip for us today.